Having a handy knife sharpener in your kitchen is a must. There is nothing like using a sharp blade to slice through nearly anything. It cuts down on cooking time, reduces stressful situations, and simply puts a meal on the table faster than a dull and unusable knife. With the advancement of technology, there is now a knife sharpener for every kind of kitchen cook. If you’re tired of using a manual sharpener, then you just might want to consider an electric product, where all you really have to do is flip a switch and slide the blade through. Below you’ll find the review for Smiths 50281 Adjustable Edge Pro Electric Knife Sharpener. 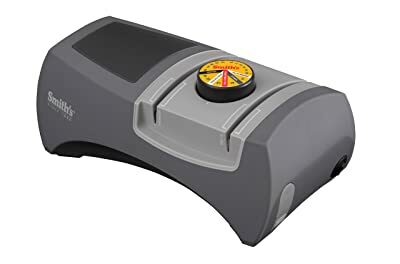 This knife sharpener is an electric knife sharpener that allows you to adjust the angle of the sharpening blocks so that your blade gets the best level of sharpening possible. The adjustability factor also ensures that your blades are protected during the entire process, increasing the overall longevity of your kitchen knives. However, while most types of sharpeners can sharpen nearly any kind of blades, this sharpener does not work with serrated or ceramic blades. Therefore, take care not to run them through this sharpener, as they will ruin the product and the knife. To begin with, the main features of this sharpener are the two step sharpening system that is made out of diamond and ceramic sharpening blocks. These two abrasive blocks can be manually adjusted, or you can simply allow them to self-align the blade for the perfect finish. Both sides of the blade are sharpened at the same time, which reduces the amount of time that you need to use to sharpen the knife. To prevent the product from slipping, this sharpener features rubber grips on the bottom, proving you with ample stability. When sharpening, you can use hunting/fishing knives, kitchen blades, tactical style knives, custom knives, outdoor knives, sports knives, and even pocket knives. This feature is excellent for those that have a diverse collection of household knives that need sharpening. The finally beneficial feature of this product is that it includes a one-year warranty. Should you have an issue, the investment that you made is protected. For those that are looking for a household knife sharpener, then this is the perfect product. This knife sharpener does an excellent job at sharpening, and can either be manually adjusted or adjust by itself for the perfect angle during sharpening. Many users are pleased with the product, and its ability to get the job done quickly and without any issues. Perhaps the best feature of this product is the one year warranty, which helps you protect your investment. Basically, you cant go wrong here.